Hope you all doing well. 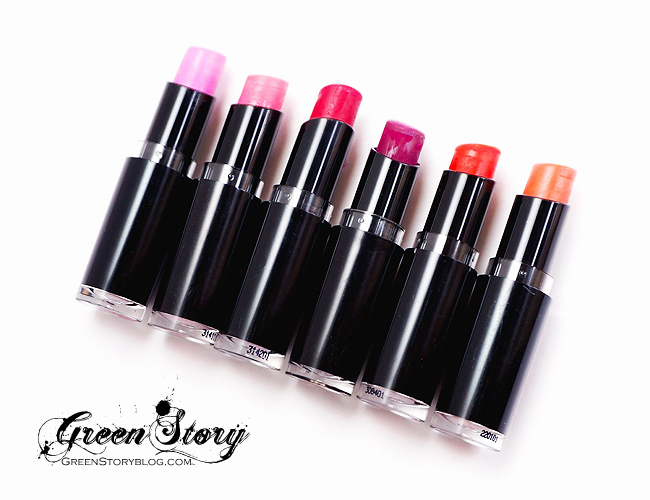 I have already individually reviewed few of Wet n Wild MegaLast Lipcolors I got. Today though to bring them all in one post. Hoping this post will help you to match and compare colors easily. 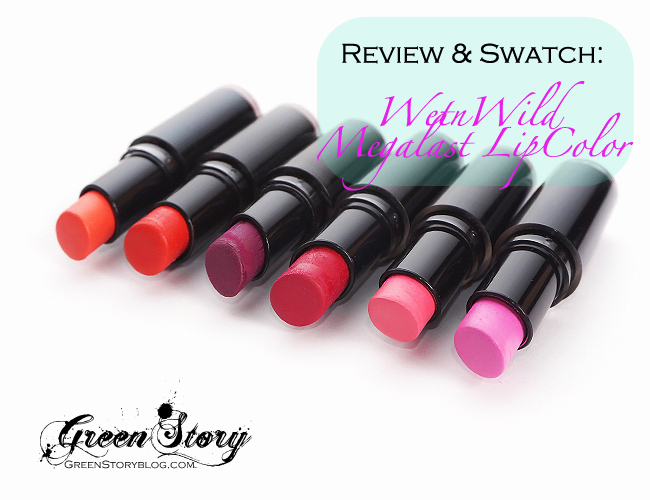 Wet n Wild MegaLast Lipcolor’s Packaging is just basic and simple yet lid is somewhat not that user friendly. It is quite impossible to close the lid without poking the lipstick itself. The lipsticks smells almost nothing. Texture of these lipstick are semi-matte, non-drying. Color pay off is outstanding. Darker shades leaves strong stain in lips. These lipstick transfers quite easily, they last around 4/5 hours on lip if you don’t eat or else. 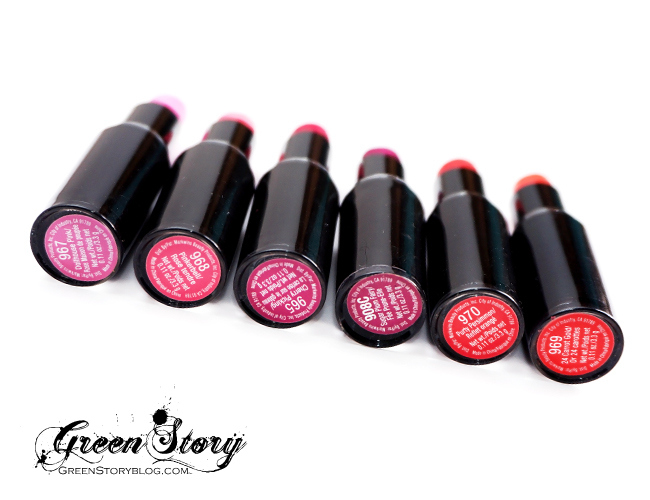 Wet n Wild MegaLast Lipcolor’s are already very popular for its price and quality however after using them for long I have slight different opinion for them now. I won’t say they are bad in anyway but it feels quite heavy on lips unlike other lipstick I’ve used which I’m not liking anymore. Probably, its just my conscious, you might not feel the same! The shade is quite similar with the color of carrot but with a bit pastel touch in it. Its an orange but there is some coral tone. This shade might not be suitable for everyone yet whoever loves orange shade I’m sure they can pull it off. Purty Persimmon is also mentioned in the label as Reflect Orange. In my eyes its a bright orange toned red. Yes its not any orange, its a Red color but with warm orange tone in it. Color might vary in lip tone. I guess, anyone having fair complexion will find Purty Persimmon more vibrant and orangish! This color is some kind of dark coll toned plumy or berry fuchsia though varies on light effect. Has strong blue undertone in it. People says it right, this shade is a perfect dupe of the famous MAC Rebel. This shade is quite a perfect cherry red but with a very strong pink undertone which makes it somehow deep fuchsia specially with white indoor ligh you will see nothing but a deep fuchsia color. However, in day light its a cherry/cool pink toned red. Pinkerbell or Tendre Rose(as mentioned in the packaging) is slightly coral toned pink. 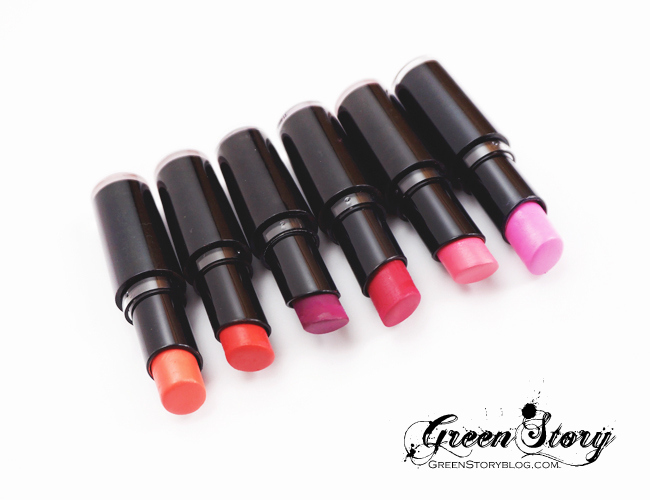 The color tone is soft but quite loud, bright and pastel, way more vibrant when you put it on lip. Doll house Pink is mentioned in the label as a rosy purple. In my eyes its slightly blue toned baby pink, an opaque dolly pink or somewhat lilac-pink. Color is way more bright when applied on lip. Pastel in texture. Very lovely colors! Thanks for sharing. Love the 24 Carrot Gold the most! Taking forever to load your images & in the end my browser can’t load them x.x. I do know they are really affordable though! is it… thanks for the info dear! I’ll try to sort the issue. Always love your make up review :) So many beauty products to review from. Particularly love 24 Carrot Gold on you. I also love Carrot gold, it’s quite an unique shade of orange. Wow! I love Pinkerball, 24 Carrot Gold & Purty Persimmon! It’s been a very long time since I had make up on since becoming a mom. BUt I seldom put make-up on because can’t find the right match yet. Thx for sharing! Oh no! The color is too wild and bright for me. It look fabulous on you though! wow so many pretty color to choose from, I definitely like the 24 carrot gold. I also like the Dollyhouse Pink, hehe. being a woman we can’t get enough of lipcolor. hey tamanna i ve subscribe ur blog today .i found it vv. interesting. but everything takes long time to load.and ya i will suggest u to make ur eyemakeup tutorials more efficient.